Fassbinder, obviously, considers that for Samuel King (Whity) being together with Hanna means to be single-handed. She is far from being stupid and she dreams about becoming a modern liberated woman, and to a certain degree, in spite of being emotionally symbiotic with Whity, she proved that she can be much more than what she is. But the paradox involved here is, that Whity is much more radical than she and this is the tragic point of her failure. 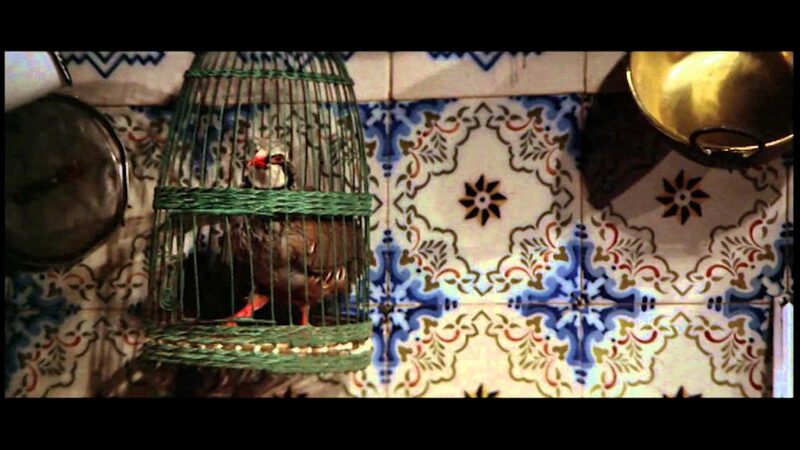 Whity’s extreme political radicalism is too much not only for Hanna and not only for Fassbinder of his own words we quoted, but for human life in general. Whity’s holistic mind pushes him farther than human life’s frame of reference. This makes him not just premodern, but anti-modern – outside of techno-structural (calculating) mind as an instrument of gaining power – be it unjust or progressively-humanistic. Whity’s moral sensibility is absolutist, borderless, ultimate. It’s not too practical, but it’s difficult not to be fascinated by it, if you live in a historical period when the “moral” climate of living is naked fight for your own and/or your side’s advantage. The anti-democratic (neo-conservative and neo-liberal forces) have succeeded in destroying the chances to fight for improvement of life conditions of the majority peacefully. By taking a belligerent and very often – insulting and malicious fighting posture they have made the fight for existing democratic laws and progressive changes through using democratic socio-political tools ineffective and near impossible. Today the fight for a better and more intelligent life for everyone is not only unable to produce discernable results, but becomes psychologically unbearable (cultural people don’t have a right to behave like conservative political thugs). The fighters for humanistic improvement of the living conditions for majority started to be perceived as any fighters for their own advantage and agenda. Left and right in this situation have both started to look equally predatory and militant. This miserable cultural (anti-cultural) condition didn’t exist (or existed in much lesser degree) when Fassbinder was creating and working on his “Whity”. The incredible achievement of his intuition was that in spite of his rational critical remarks about the hero of his film, he felt that his Whity’s moral radicalism transcending the borderline between life and death (and as such looking like fruitless extremism) is somehow proper and justified. From the one side, Whity’s father, step-mother and his half-brother Frank were so unbearably disgustingly criminal and immoral, but from the other side to kill them in the corrupt atmosphere of a society in which they will never be punished by law (being exceptionally financially fortified tricksters), means to commit a crime, and this crime will not allow Whity to continue to live meaningfully. Today, the open enemies of democracy armed with money they use as a crushing and corrupting weapon and as a protection against any prosecution, cannot be defeated by rational means of democratic socio-political instruments. In this situation only… martyrdom seems as a rational, logical reaction on the order of things. Whity‘s self-punishment by death in the desert should be understood as such a martyrdom. He already in the end of 19th century felt the nightmarish possibility of the appearance in future of an ultimate enemy of morality. So, Fassbinder simultaneously, agrees and disagrees with Whity’s “desert” solution. He disagreed with such an end around 1970, when political and moral atmosphere was allowing such a disagreement (when “suppressed individuals” were uniting and acting together for their liberation), and he agreed with it, when, as it‘s happening today in the 21st century, there is, it seems, no another way – when the legions of conservatives storm the heavens as dark clouds – the sun. But in a way Whity was in a better situation than we’re today – he could punish the evil and then punish himself. Today, we cannot succeed with the first part – the enemy is too protected by technological, financial and propagandist tools and their own ruthlessness. We only have the second part as available reaction of protest. How can a film which from the first glance look oxymoronic – as a “reformed” and a sophisticated Western, with real connotations, not only denotations looking like connotations, can address so different realities coded in various historical periods, and can contemplate so easily – without sentimental dramatization about such tormenting areas of human experience? Corner of the kitchen at the mansion of Whity’s father Ben Nicholson (Ron Randell), – with a pheasant in the cage (waiting for its glorious end), where Whity and his mother work everyday. Fassbinder (to the right) plays a pretentious money hunter with a pompous dream of becoming a millionaire (in our time these types dream of making billions). 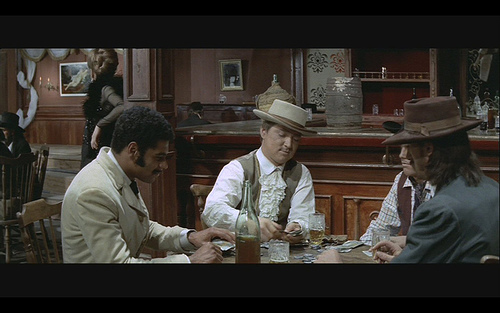 Fassbinder’s character in the film, a person who recently organized collective throwing Whity out of the saloon, stopped to be racist by magic when he learned that Whity got money and is ready to play cards. Whity’s money quickly disappeared in the future millionaire’s pockets.